Hydrangeas are woody, flowering shrubs. They grow into large, leafy bushes that bloom in the late spring. The most common variety is known as Bigleaf Hydrangea. They grow in hardiness zones from 5B to 9A and do equally well in containers as they do in the garden or as a hedge. The flowers are usually enormous blooms in varying shades of white, pink, red or blue. Their color is determined by the pH of the soil and can be altered accordingly. In fertile, moist soil, plant food is not normally a requirement for hydrangeas. They prefer a rich, moist soil and do equally well in partial shade or full sunlight. Signs that your plant might need plant food would be poor growth or a lack of blooms. Another reason to add plant food would be to alter the color of the blossoms. 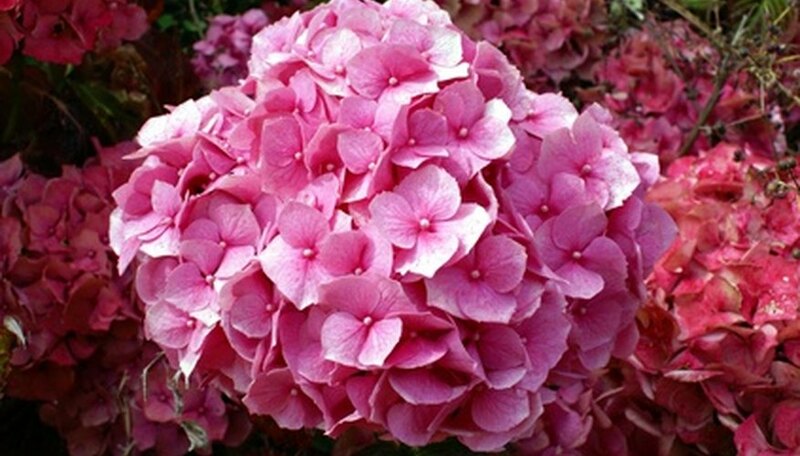 To maintain the pink or red color of your hydrangea, the soil pH needs to remain at 6.0 to 6.2 or higher. At higher pH levels, hydrangeas cannot absorb aluminum from the soil, which is what gives them a blue color. To raise the pH of your soil, add some dolomite lime several times throughout the growing season. If you prefer a blended fertilizer, use one with a higher phosphorus level. Phosphorus is designated by the middle number in the fertilizer identification, such as 10-10-10. The middle number should be higher to raise the pH as phosphorus prevents the plant from taking in aluminum. The converse of the pink hydrangea formula is true for blue hydrangeas. In this case the pH needs to be lower, between 5.25 to 5.5, to permit the uptake of aluminum through the roots. Powdered aluminum sulfate can be mixed at the rate of ½ tablespoon to a gallon of water. This solution should be used to water the plants throughout the growing season. If using a blended fertilizer, choose one with low phosphorus (the middle number) and a higher potassium number (the last number). Peat moss and pine needles are organic soil acidifiers. Mulching either of these into the soil or using them as a top dressing around the base of the plant will slowly change the pH to a more acidic one without causing negative changes to any of the other soil nutrients. The drawback is that the change happens slowly over time as the mulch breaks down into the soil. Concrete may contain lime. With time a concrete side walk or border will raise the pH of the surrounding soil and change its acidity. Planting hydrangeas near these fixtures will cause your blooms to become pink as the lime from the concrete leaches into the soil. If blue is the preferred color, plant hydrangeas away from concrete fixtures.